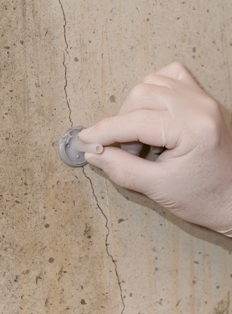 Fixing a crack using the same high strength epoxy that professionals use is now easily done with the LCR Liquid Concrete Repair Kit. The repair is done from the inside using a standard caulking gun where with low pressure, you “inject’ the liquid epoxy into the crack, filling the entire inside of the crack top to bottom with a high strength epoxy. 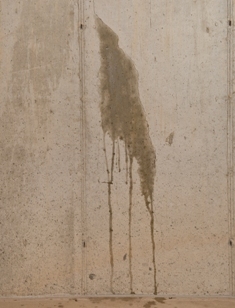 The epoxy cures and forms a “permanent” weld of the cracked concrete and water will not be able to re-enter the crack. The Kit contains all materials you need to repair an average basement foundation crack 8′ tall, 8″ thick and 1/16″ wide. 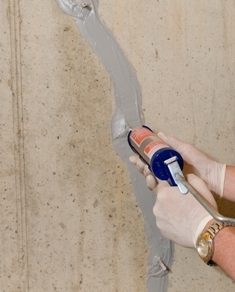 To begin you start with a dry non-leaking crack and wire brush the crack to clean off dirt, paint or loose material. Next Mix equal amounts of of Part A Epoxy Paste with Part B (about golf ball sizes) until mixture is streak free and a uniform gray color. Roll the edge of the port in the mixed epoxy. Place the center of the port directly over the crack. Apply mixed epoxy paste around the base of the port and seal the crack between the ports. 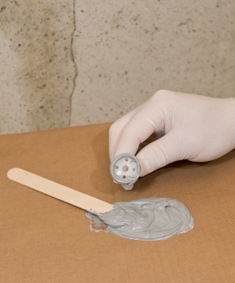 Make sure you apply a heavy layer of paste around the base of each port. 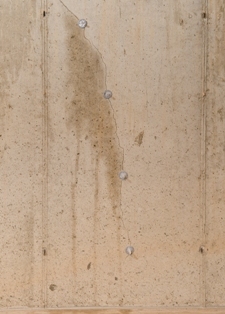 Also apply a bead of epoxy at the base of the crack along the floor/wall joint about 6″ either side of the crack. Once the entire crack has been sealed, allow to cure for at least 12 hours until plastic hard where the epoxy surface paste can be scratched with a nail. Follow the mixing instructions for the epoxy injection cartridge and load into a standard caulking gun. Start at the lowest injection port and begin pumping the liquid epoxy into the crack using firm and steady hand pressure. Do not force the epoxy, simply let it flow into the crack until it appears at the next higher port and release the pressure on the cartridge before removing the nozzle from the port. Cap the lower port and move up to the next higher port and repeat until the entire crack has been filled. Ports and surface paste can be removed the next day after a full 24 hour cure.